In 2015, roughly 1.5 million migrants and refugees were estimated to have arrived in Europe from various countries, particularly Syria, Afghanistan and Iraq. Images of desperate people massing at train stations, struggling with police or worse have filled our newspapers and television screens on an almost daily basis as the terrible humanitarian crisis unfolds. In the face of mounting catastrophe, Angela Merkel suspended European asylum rules and allowed an estimated one million migrants to enter Germany through Austria. This move earned her the grandiloquent praise of all of the ‘respectable’ media, not to mention a Nobel Peace Prize, but has done nothing to halt the flow of migrants into the Balkans, nor the deepening East-West split precipitated by the onset of the crisis. This is completely in keeping with what has become the traditional policy of “Fortress Europe” in relation to migrants from its former colonies. In August 2010, the Libyan dictator, Col Muammar Gaddafi, paid a high-profile visit to his friend, Silvio Berlusconi, the then Prime Minister of Italy. During a ceremony in Rome, Gaddafi declared that unless his request for €5 billion a year was met by the European Union, “Tomorrow Europe might no longer be European and even black as there are millions who want to come in,” threatening that the stalwart efforts of the Libyan navy to protect European waters would be overwhelmed by migrants from sub-Saharan Africa, tens of thousands of whom were already making the perilous journey across the Mediterranean to reach the Italian coast. 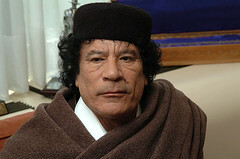 Gaddafi’s cynical attempt at extortion was decried as “demanding mafia-style protection money” by members of the Italian parliament, who are very familiar with such things. However, despite this and reports that migrants were being held in Libyan “concentration camps”, in October of the same year the European Commission eventually agreed to a deal in which the EU would provide a total of €50m over the next 3 years. A year later, Gaddafi was dead and Libya was rapidly sliding into the chaotic civil war which rages to this day. Following the loss of Gaddafi as Europe’s guard dog, and the destruction of the war, an even greater influx of migrants and refugees began to attempt to cross the sea to Italy. Between October 2013 and October 2014, more than 100,000 were rescued by the Italian navy whilst over 3,000 died attempting to cross the Mediterranean. The response of the European Union’s border agency, Frontex, to this crisis was to replace the outgoing Italian “Mare Nostrum” operation with “Operation Triton”, which was to focus on “border surveillance” within 30 miles of the Italian coastline with less than a third of its predecessor’s budget. Between January and April 2015, 1,600 people were estimated to have died making the crossing. On a single day roughly 650 died when their boat capsized off the coast of Libya, prompting David Cameron to call for “comprehensive action” to save the same people he would describe as a “swarm” later in the year. In return for economic aid and visa agreements, not to mention cold hard cash, the King of Morocco has provided an effective, and ruthless, border control service, often using police to clear and burn down migrant camps (along with migrants’ possessions in some cases). As a result, Morocco is now the least used of the main transit routes for African migration into Europe, despite its proximity to the Spanish border. The Spanish police have also played their part in scenes reminiscent of the Berlin Wall. Anyadike reports, “Getting past the Moroccan border guards, the three layers of security fencing, the razor wire, motion sensors, CCTV cameras and the Spanish Guarda Civil is now next to impossible.” The Guarda Civil has also been known to fire rubber bullets and tear gas into crowds of migrants attempting to swim into Spanish controlled ports, a measure which caused the deaths of 15 migrants in 2014. As has always been the case, the price of the (rapidly diminishing) privileges and liberties enjoyed within the imperialist powers is the exploitation and oppression of millions in the so-called Third World. Accordingly, the EU has always treated its neighbouring states (often former colonies) as “buffer zones” or “spheres of influence”. However, what is becoming increasingly apparent is that the EU has lost control of the situation. The fact that Erdogan has been able to extort such a huge sum shows the desperation on the part of the Commission during their negotiations. A key driving factor in the Commission’s willingness to bend the knee to Erdogan is the role of the right-wing, nationalist regimes which have occupied most of Eastern Europe since the fall of the Soviet Union. The Hungarian Prime Minister, Viktor Orban, in many ways Europe’s Donald Trump, has proclaimed himself the defender of “European Christianity” against a Muslim influx. As part of this crusade, he has overseen the erection of miles of barbed wire fencing designed to keep migrants out. Not only that, but in scenes reminiscent of the Second World War, migrants in Hungary have been piled onto trains taking them, uninformed, to internment camps in the countryside. Orban is not alone on this issue – the Slovakian PM, Robert Fico, recently stated, “Not only are we refusing mandatory quotas, we will never make a voluntary decision that would lead to formation of a united Muslim community in Slovakia.” At the end of last year he even threatened that Slovakia would leave the EU if it were forced to accept refugees. Meanwhile, Poland’s ruling “Catholic Law and Justice Party” is currently in a bitter row with the Commission over its undemocratic media laws, in which the Polish Defence Minister has openly referred to the Nazi occupation as old divisions begin to re-appear. In the past, when European, and particularly German, imperialism was stronger and more assured it was able to profit from the destabilisation of other parts of the world. In the 1990s Germany was re-unified and welcomed hundreds of thousands of migrants and asylum seekers from the former Yugoslavia and Turkey. Later, in 2004, the EU saw the largest expansion in its history as ten countries - of which eight were from the former Eastern Bloc and Yugoslavia - joined the union. The Schengen Area - photo: Rob984During the boom years a symbiotic relationship developed: ‘New Europe’ opened up a huge new market and swathes of cheap labour for exploitation and, in return, these states were able to access EU funding and offer their citizens the opportunity to find work in the larger European economies. If anything, the strong nationalist and religious streak common to many post-Soviet Eastern European regimes was a bonus, spreading virulently anti-communist prejudices with unparalleled enthusiasm. However, now the going has got tough, the likes of Orban have been quick to bite their master’s hand and the EU is seemingly powerless to ‘discipline’ them. By caving into this pressure, suspending rules designed to allow free movement between participating states and by accepting the vast majority of migrants, Merkel has only moved the crisis along, both geographically and temporally. Already German public opinion has begun to swing against any further immigration, against the EU (though by no means decisively) and against Merkel. The recent reports of sexual assaults in Cologne and their coverage in the media will do nothing to calm the situation. Meanwhile, the mass migration from Syria and elsewhere will inevitably continue as more people flee for their lives. Turkey will not be able to prevent them all from crossing into Europe by either humane or violent means. As a result, the Schengen agreement will either have to remain a dead letter or be rewritten entirely, to the satisfaction of the nationalist right. The importance of a collapse of the Schengen agreement cannot be underestimated. Jean-Claude Juncker, the President of the European Commission, has even said, “If the spirit of Schengen leaves us forever and leaves our hearts we’ll lose more than the Schengen agreement. A single currency doesn’t make sense if Schengen fails.” If this stark prediction were to come to fruition, the resulting EU would be very different to what we see today. For an end to imperialism! As the migrant crisis goes on and more lives are lost, it is important to remember that while there are many important factors at play in this huge humanitarian disaster, it will not be possible to solve any of them without a fundamental change, starting right here in Europe. Migrants (‘economic’ or refugees – it shouldn’t matter) give up their life savings and even their bodies, travelling for hundreds of miles in unimaginable conditions to then risk their lives trying to get into Europe, for the simple reason that it is simply impossible for them to find a better life in their home countries. It is no accident that the main sources of migration into Europe are places like Afghanistan, Iraq, West Africa and, of course, Syria. All of these countries have been carved up and exploited by European imperialism for over 100 years. The creation of the EU did not stop this; if anything it concentrated it. Further, for all the hand-wringing about human rights, the various brutal regimes in Turkey, North Africa and the Middle East would likely be considerably more enlightened and democratic if they weren’t being systematically meddled with, either by economic or military inducements in order to do the bidding of our own ‘humanitarian’ rulers. Nor is it an historical coincidence that the collapse of the USSR has resulted either in social collapse, genocide (as in Yugoslavia), or the rise of ultra-right and even fascist forces (as in Ukraine). Imperialism can overthrow a regime, but it can only replace it with whatever it has to hand. In this sense, vicious reactionaries such as Orban were - and continue to be - an important ingredient in the ‘democratisation’ of Eastern Europe. Lenin said that capitalism was “horror without end”. Now, the global crisis has begun to expose all of the real nature of this system. The emperor stands naked. Ultimately, the workers and youth of Europe have much more in common with African or Middle Eastern migrants (or any other for that matter) than Merkel, Cameron and their reactionary pawns. We have the means to build a world without borders and free from the horrors which make people so desperate to cross them. We must reject the hypocrisy of our leaders, both in the UK and the EU. We must demand justice for those killed by imperialism. We must fight for socialism!